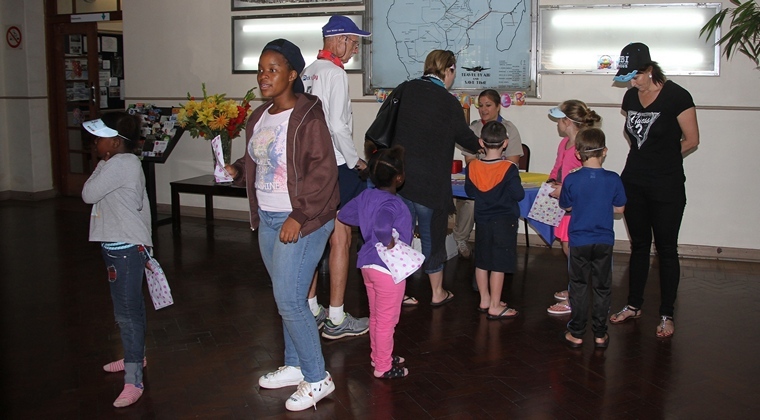 The Rand Airport Family Fun day was organised by the airport management to bring awareness to Rand Airport and to show the public and aviators what Rand Airport has to offer. 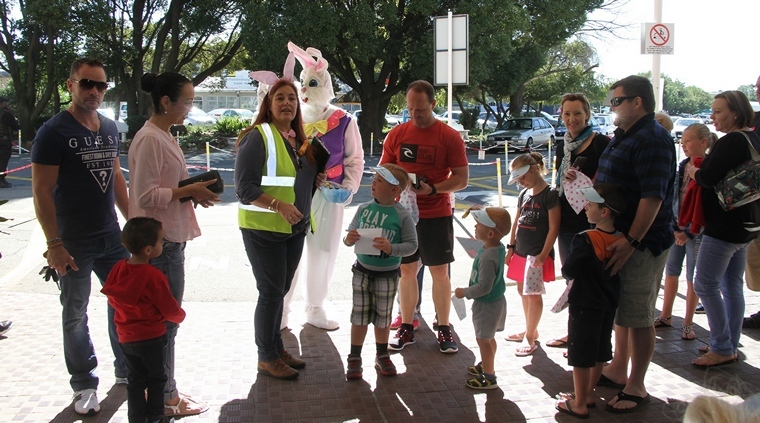 Airport Management wanted this day to be a family day, and organised an Easter egg hunt for all the children from 10am, where they received a map, a cap and had to find different points on the airport. At each point they received an Easter egg to put in their goody bags and received a chocolate bunny at the end of their hunt. 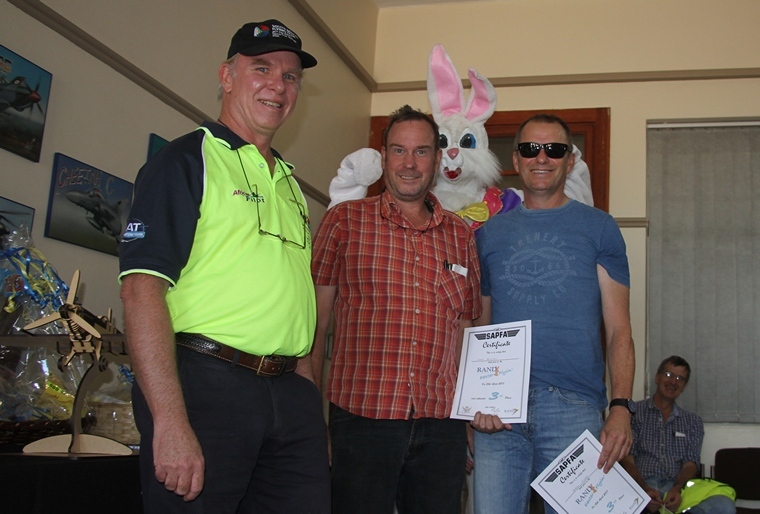 To keep the children busy jumping castles and kiddie rides were on offer and of course the Easter bunny came to visit for the day. 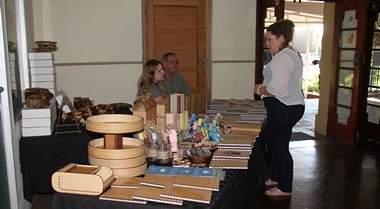 There was a craft market to browse around, hot dogs, wors rolls, chip n dip for the empty tummies and cold drinks for sale at very reasonable prices trying not to break the bank. 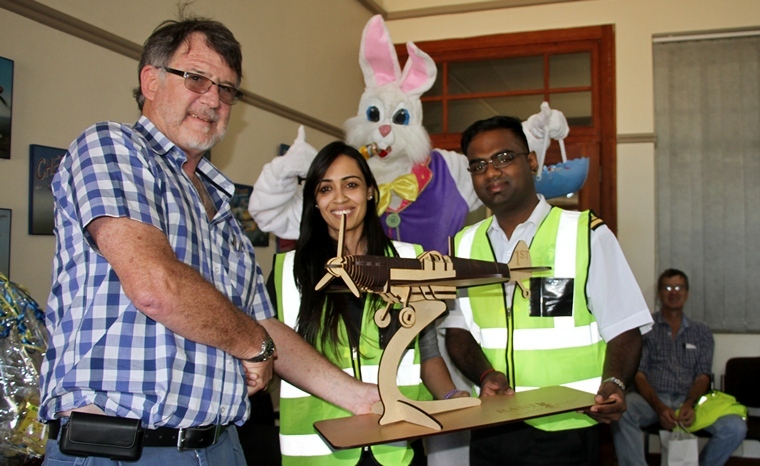 Management also decided, as part of the Airport Open Day on Easter Saturday, to have a Fly-in and waived landing fees and reducing fuel prices to attract visitors from out of town. Then the idea was then sprung about the possibility of having an Easter Fun Rally, and at short notice of 2 weeks, managed to put together an EAA Sun & Fun style Adventure Rally, which has as its theme finding Easter Eggs in any case, so more appropriate in actually having an event associated with the Easter weekend. At this short notice and in planning the event, the extent of getting the word out for participants to enter probably proved to be too short, and of course being an Easter weekend, many flyers were probably elsewhere on a long weekend. The Adventure Rally format is a more relaxed fun kind of event mostly involving observation out of the window recognition of ground features and learning about the area being flown over, rather than the high workload of accurate timing, but it is important to have a good crew cooperation on roles and responsibilities, and given the comments heard from the participants after the flight, it seems some cockpits had some hilarious moments. The main theme of the route that was to be followed was to overfly or pass as many airfields as possible, in this case 9 of them (while one being a model aerodrome - could pass muster for an emergency forced landing), where the idea was to instil knowledge of options should a forced or precautionary landing place be necessary. The route was then pre-planned on a 1:250 000 map with all turning points marked up, except for two of them which were to be airfields to land at, the first one a touch and go, and the second a full stop to pick a clue. 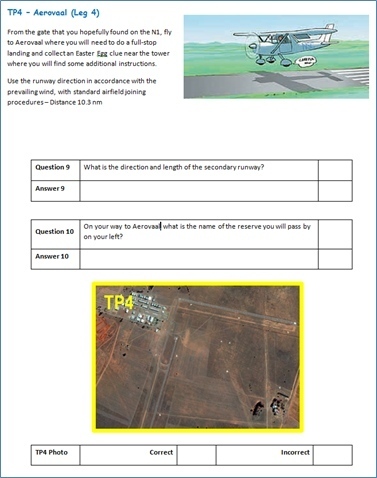 The identification of the two airports were of course in cryptic form, but had clear answers in the wiki section of the task booklet, at the briefing everybody was advised that not reading the wiki notes would be at their peril�. . Some crews of course were googling for answers on their cell phones - because they can - somewhat inefficient given everything was right in front of them. 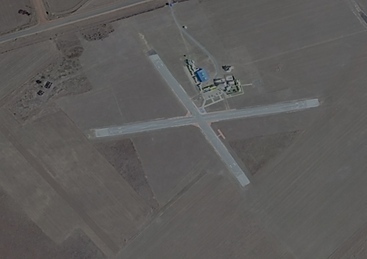 It seems at least one of the competitors was heading off to the wrong airfields, it did not help that the turning point photos which had to be marked as being correct / incorrect were in fact incorrect. 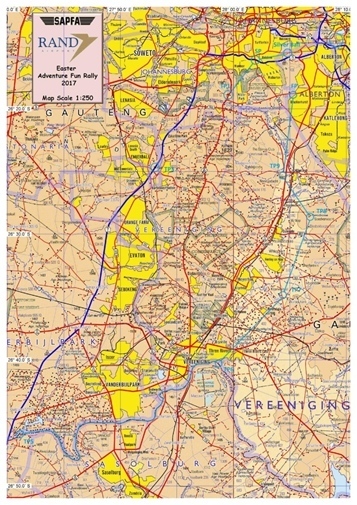 The route essentially started out west of the silver ball, then southwards to do a touch & go at Tedderfield, further south to the toll plaza then a full stop at Vereeniging (also known as Aerovaal) to pick up a clue, which was to take a picture to the first big body of water seen from the south, and seeing some of the pictures taken, it must have been difficult to take this by the navigator point the camera out the back window. 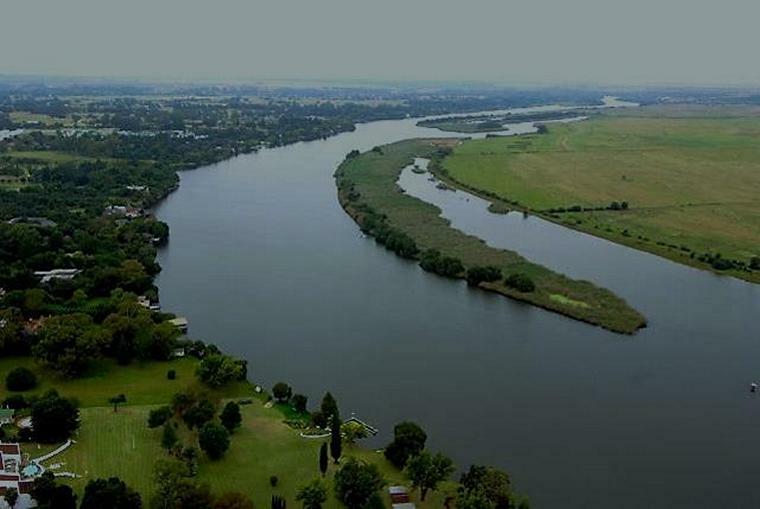 The route further went down to the barrage and then followed the river up to the three rivers junction, from there airfield hopping all the way back to Romeo Delta, with the last turning point being the new Heineken Brewery. There were 7 crews who registered by briefing time, with a broad spectrum of aircraft participating, from Beechcraft Bonanza to a Jabiru. The weather was absolutely crystal clear with very little wind, a real ideal day to fly. After the briefing, and with 20 minutes prior take-off - of handing out papers, the first competitors took to the skies at 10.15, with the last off at 10.45. 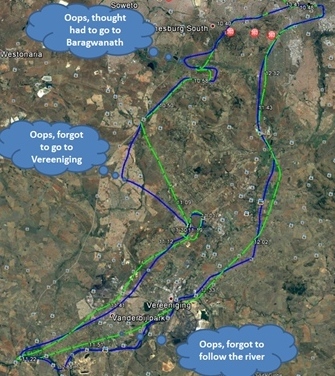 As with some previous rally events, live tracking was done and displayed on the big screen in the briefing room, where two tracks were being followed by spectators with great interest, the blue competitor having got temporarily lost getting to the two airfields, and the green competitor having missed reading the instruction of following the river. It would have been interesting to have seen what the others were doing�. With everybody successfully home, it was time for marking the exam papers which was left to the strict invigilators volunteering for this task , well known Irene Mock - EAA Chapter 322 and Sandra Strydom our friendly Aero Club representative to record the points. Between the clues and photo recognition, a total of 40 points could be scored. When all was tallied up, there was a tie for first place�., which happened before in 2015, where an Aces High card determined the outcome. This time without any cards available, the two tied teams had to select two dominos each with the highest score the winner, going to Sheetal Somla & Ashveer Rajpal who competed in a C182. 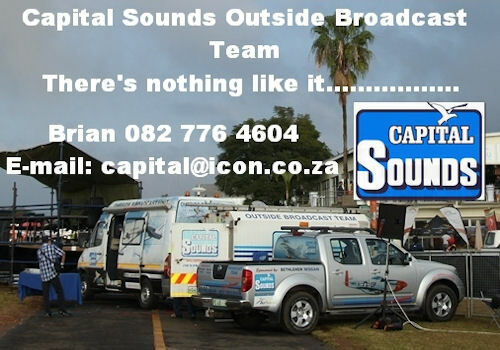 Many thanks are extended to Carolle Olivier assisting with the administration of the event, Stuart Coetzee the Rand Airport Manager for all the arrangements and the clue giver at Vereeeniging, and Paul Roberts looking after safety and present at the Tedderfield touch & go's. 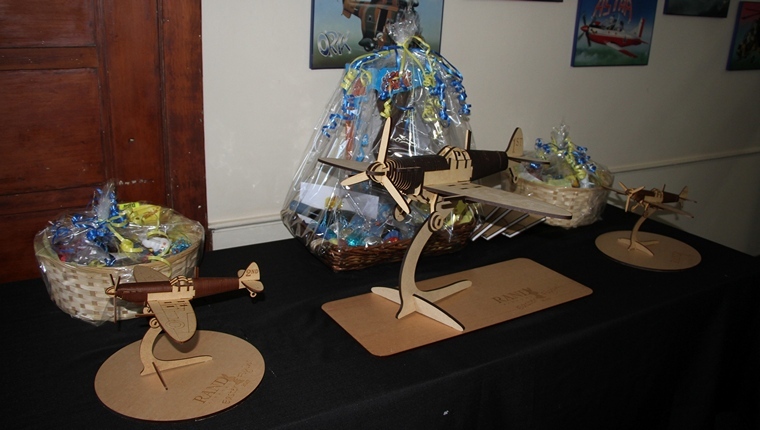 The prize-giving resulted in the top 3 places winning stunning laser cut aircraft and Easter hampers, the winner also winning 100 l of fuel, many thanks to Rand Airport management for the generous prizes on offer. 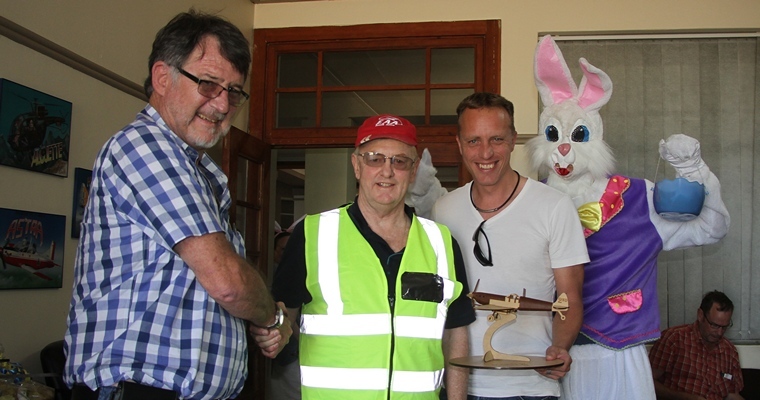 Rob Jonkers with Leon Bouttell and Adrian Viljoen who finished 3rd. 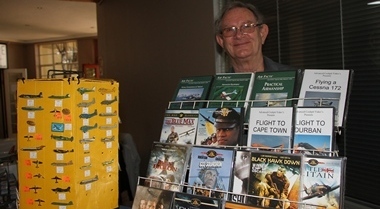 Thus came to the end of a hopefully enjoyable day for everybody who took part, although not a big field, the possibility of having this format of rally planned earlier for next year's Rand Airport Easter Fly-in should bring on more interest, and for sure this is an excellent way of converting Avgas into Fun.